(Steve Griffin | The Salt Lake Tribune) Statue of Martha Hughes Cannon at the Utah Capitol. Gov. 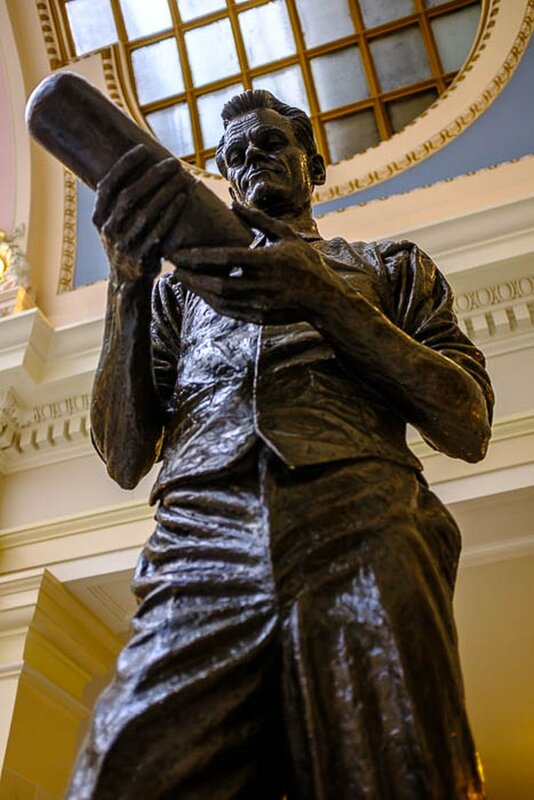 Gary Herbert has signed SJR1, initiating the replacement of the state's statue of Philo Farnsworth in the United States Capitol with a statue of Cannon. Gov. Gary Herbert said Wednesday he signed a bill into law to evict television inventor Philo T. Farnsworth — or at least a statue of him — from the U.S. Capitol to make way for one of Martha Hughes Cannon, the nation’s first woman state senator. Each state is allowed to place two statues in the Capitol to honor prominent historical residents. Utah had placed Brigham Young, who led Mormon pioneers to the state, and Farnsworth. Cannon supporters argued it is time for a Utah woman to be there and pushed Cannon — a Mormon pioneer, polygamous wife and doctor who defeated her own husband when she won her state Senate seat in 1896. (Trent Nelson | The Salt Lake Tribune) James R. Avati's statue of Philo T. Farnsworth, known as the "Father of Television," in the Utah Capitol in Salt Lake City, Tuesday, Jan. 30, 2018. Some opposition also arose to having statues of two polygamists represent Utah. The collection of state statues in the U.S. Capitol includes only nine other women: Helen Keller, the first deaf-blind person to earn a college degree, from Alabama; Mother Joseph, a humanitarian missionary from Washington; Esther Hobart Morris, a Wyoming suffragette; Jeannette Rankin, Montana, the first woman member of Congress; Florence Sabin, a public health pioneer from Colorado; Sacagawea, North Dakota, a guide for the Lewis and Clark expedition; Maria Sanford, a Minnesota educator; Frances Willard, Illinois, a temperance movement activist; and Sarah Winnemucca, Nevada, who helped save her Piute tribe. • Medical marijuana: Herbert also signed HB195 to give terminally ill patients the right to try medical marijuana. He is yet to sign a companion bill, HB197, needed to set up a state system to grow and dispense marijuana for them. Supporters of a ballot initiative to allow medical marijuana in Utah have said those two bills don’t go far enough, and will proceed to put their measure on the ballot. The Utah Patients Coalition said it has gathered more than 150,000 signatures — well beyond the 113,000 needed to qualify. • Cold cremation: HB121 allows “cold cremation” or “alkaline hydrolysis” as an alternative to by-fire cremation or burial. It uses chemicals to dissolve bodies and is considered more environmentally friendly than regular cremation with less pollution. • Honoring prominent Utahns: The governor signed joint resolutions honoring the late philanthropist and businessman Jon Huntsman Sr.; Utah Valley University President Matthew Holland, who is leaving to serve as an LDS mission president; and renaming Starvation State Park in honor of the late Fred Hayes, who directed the state park system. • Veto: Herbert vetoed a bill at the request of its sponsor. HB322 made amendments to laws governing non-emergency patient transportation. Rep. Ed Redd, R-Logan, said that on the hectic last night of the session, lawmakers passed an amendment that had inadvertently omitted 10 words. Herbert wrote in a veto message the omission would prevent some providers from offering facility-to-facility transportation for patients and would increase costs. He said he would support consideration of a corrected bill in a future special or general session of the Legislature.